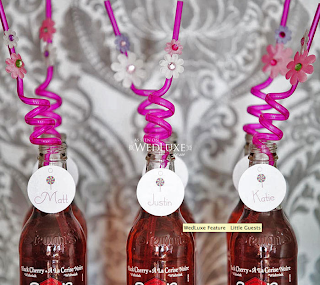 Weddings InStyle is nestled in the historic Byward Market in downtown Ottawa. Old-world charm meets modern amenities. Your guests will be surrounded with natural sunlight, exposed brick, hardwood floors, and a very New York Loft feel. City Hall – well its City Hall. Our Wedding Chapel is pre-decorated, private and intimate. We are the opposite of City Hall, so imagine, chic, elegance, style and exchanging vows by candlelight. City Hall does not permit wedding décor or candles and let’s face it – everyone looks better by candlelit! We are available to perform private ceremonies onsite 7 days week by appointment. 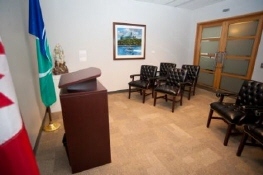 City Hall only offers Monday to Friday, between 9-4 Friday evenings, between 5-7 and Saturday afternoons between 1-3. It works on a first come first serve basis and you must wait in the common area where people come to apply for permits and pay parking tickets. We offer the ability write your own vows or choose from a variety of traditional vows you feel best reflects you as a couple and this is something that we would be honored to help you with. City Hall does not offer custom vows and uses clinical words such as “The province of Ontario” in your vows. We can accommodate 100 people comfortably. Where City Hall has a 7 person maximum restriction. We can provide two witnesses if you want to truly elope and surprise your friends and family. City Hall do not provide witnesses. 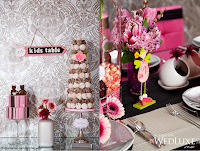 We offer full service weddings including food, bar, wedding planning and coordination services. City Hall does not permit food and alcohol onsite and are not allowed to make recommendations to other local businesses – I know! Strange?! Weddings InStyle can be booked for as long as you wish if you would like to have a cocktail reception or formal dinner following your ceremony. City Hall has a maximum time allowance of 30 minutes. …. And the number one reason why Weddings InStyle is better than City Hall is that we have a beautiful brides room onsite where our couples can get ready and make their grand entrance to their music of choice. Your only option at City Hall is the public bathroom and you have to forgo the grand entrance as you must wait together on the main level and music is not an option. Let City Hall take care of your taxes, NOT your weddings! Pass it on! Summer is here and who can't use an extra pair of flip flops? We know, we know: we are seeing this trend everywhere. But, bear with us, because they’re a really good idea. Obviously, you want your friends and family to hit the dance floor and dance the night away? after all that is why you either hired a great DJ, trendy band or spend hours making your own special playlists, right? If you want your guests to really bust a move, its best to make sure that they are comfortable to do so. Most ladies feet start to expire in higher heels close to the 3-4 hour mark especially when standing. 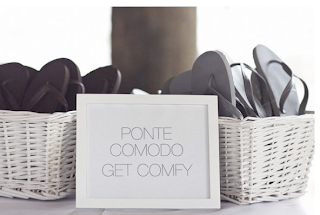 Give your guests a good excuse to kick off their shoes, and party with you. And remember, everyone can always use an extra pair of flip flops! Here's how you can do it inexpensively. If your feet get tired and sore, grab a pair and dance some more! In less than two weeks, I have the honour and the privilege of marrying my best friend of 25 years. 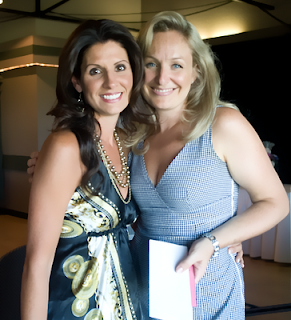 We met decades ago at Lisgar Collegiate and have been inseparable ever since. She is my partner in crime, my champagne girl, my confident, someone who has seen me at my worst and celebrated me at my best. She was my first call when I found out I was expecting and in true best friend form, delivered (literally) 7 months after me telling her my son would need a friend. We have had sleepovers & sleepless nights of supporting the other thru the dramas of life and early heartbreak. We have been by each other side for all the milestones, our first cars, our first pets, our first loves, our first 'real jobs' our first homes, engagements, children ... and now marriage. Single life used to mean bubbles & smoked salmon on a patio, talking endlessly about what was going on in our respective lives. We didn't have a curfew and getting up before 10am was unheard of. Then came the next phase in our life ... kids. It is by chance we met . . .
Once kids arrived, we spent EVERY morning having home made muffins and coffee & tea and swapping clothes & stories about our new reality. We took turns rocking the others child to sleep so we could enjoy a few moments of serenity. Fridays soon brought a smile back to our faces. It was bubbles & smoked salmon all over again, only this time at home, not on a swanky patio, often in yoga pants not cute little sundresses and Baby Einstein was our music of choice. Some years later, I decided to venture out into the free enterprise world and create this whole "InStyle" brand. Most thought I was crazy! You are going to quit your corporate job and you are going to what? Start a Concierge company? Here is how I saw things, as a busy corporate mom, I was struggling to get everything that I needed to accomplish in a day done, especially with a small child in tow, I figured I wasn’t alone and needed to do something about it. 5 years later on April of this year I was recognized as being one of Ottawa's Top 40 under 40 in business. To no surprise, Jill was by my side. She always secretly cheered me on, even though I am sure from a distance she had no clue what Balance InStyle was all about. Years later, after the birth of her second child - I had the birth of another kind. Twins. Weddings InStyle & Events InStyle was born. I decided to upgrade my home office business and take the biggest leap of faith yet ... Become a lease holder in the Byward Market and create a high end Wedding Chapel & Event Space. I knew that I needed my partner in crime to pull this off. So I asked Jill to come and work with me ... 2 years later we are an established business, are both licensed officiants and have the privilege to marry couples some 4-5 times a week. 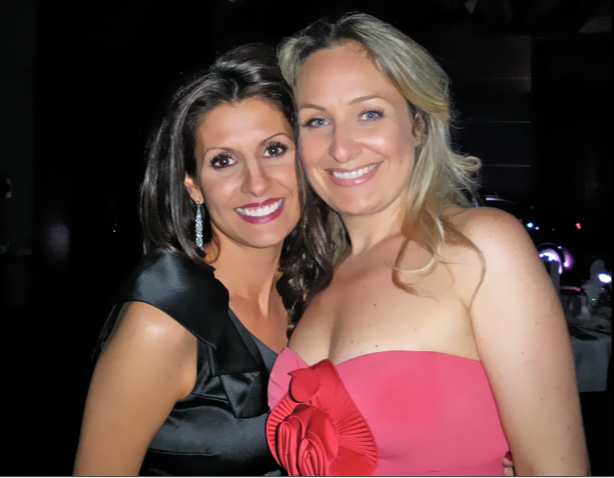 Jill has been an invaluable part of Weddings InStyle - most of you reading this blog are likely past brides or grooms, couples who are waiting for their big " I Do InStyle" or are vendors or suppliers or friends who knows just how wonderful she is. I am proud to call her my backbone, my best friend. The best part about creating Wedding InStyle is the fact that I am licensed by the province of Ontario to marry people. What most people don't know, is that I prefer to be behind the scenes, creating, designing, dreaming up our next InStyle blog, contest and running all the businesses in general. Jill has performed ALL of the InStyle ceremonies to date with the exception of outside officiants who frequently perform weddings here as well. Saturday July 23rd, 2011 @ 4:30pm will be my first ceremony, and what a privilege ... I get to marry my best friend. After 13 years, 2 kids, 2 cars, a cat and a mortgage the day has arrived where Jill will marry her soul mate, the father of her kids Stephane. I am almost sure that it is NOT generally the officiant who is shedding tears during the ceremony but this is a promise I cannot make. I mean, how lucky am I? 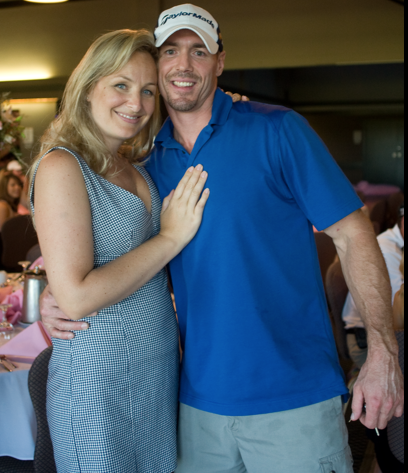 When we share the story of me being the one to marry Jill, the most common statement and question is, OMGosh ... will she marry you? All I can say to that is this ...I have recently found my version of a modern day prince charming, so stayed tuned. We are at the beginning of our story book romance and like with any great love story the happily ever after is usually reserved for the very end. Looking forward to sharing with you one of the most important days of our Weddings InStyle journey to date. 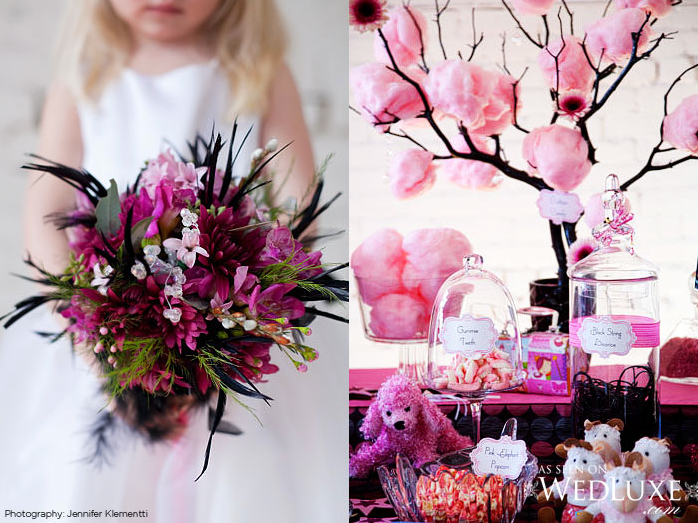 Small headpieces adorned with jewels, tulle, flowers and most importantly, feathers seem to be all the rage these days ... We are delighted to be able to run a contest in collaboration with the one and only Madeleine Cormier from Chapeaux de Madeleine. Some of you might already know her, but for those who don't she has an adorable store steps away from us in the Time Square Building in the Byward Market. Madeleine’s hats have received high praise in fashion circles across North America, captured the eye of international critics at L’Oreal Fashion Week, and contributed to a dynamic partnership with Canadian designer Jayn Simpson. She even designed some fascinators/head adornments that were worn at the Royal Wedding. From weddings, religious ceremonies, gala dinners and garden parties to cruise ship holidays and strolls around town — They all are equally worthy of the statement made by a fascinator/hat. 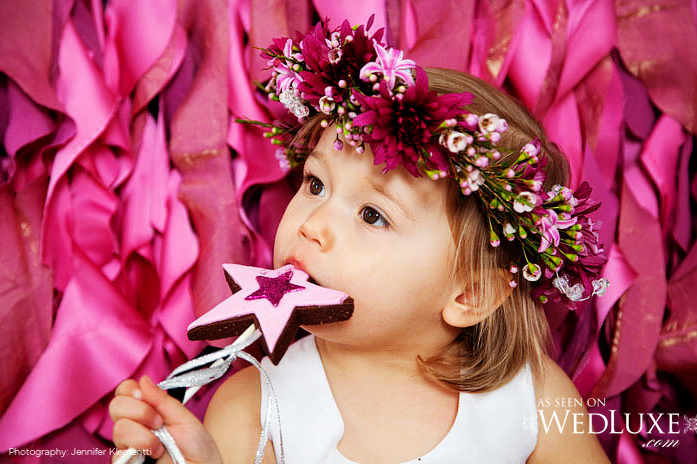 The lucky winner will receive $125.00 to spend at Chapeaux de Madeleine. There are tons of already ready made fascinators what will delight you, or if you wish to have something custom made you can do that too .. Very InStyle!!!! The possibilities and the fun you will have when you hit the town are endless! Here's to taking it up a notch this summer and having some sassy fun, be it for your upcoming wedding or a special event where you just want to make a statement! 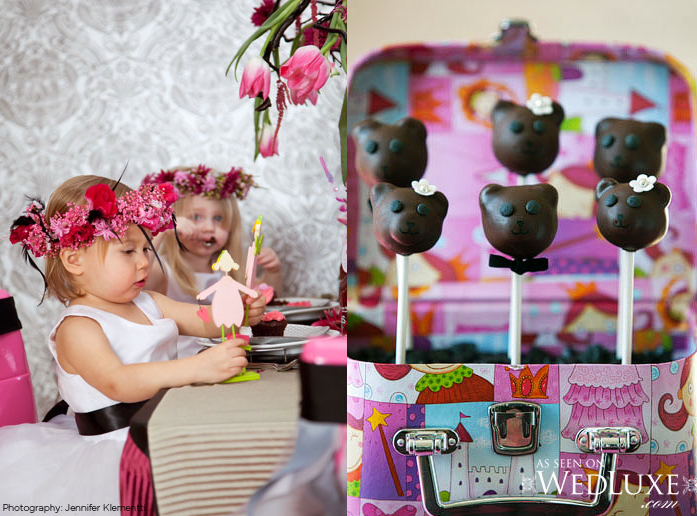 WedLux featured this ADORABLE spread, we thought it too cute NOT to share. Jennifer Klementti photography captured this busy little people to perfection. I hope you enjoy this feature as much as we did. 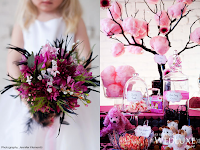 Those adorable yet busy little people who you love are often the ones that are overlooked when planning out the details of the wedding reception. 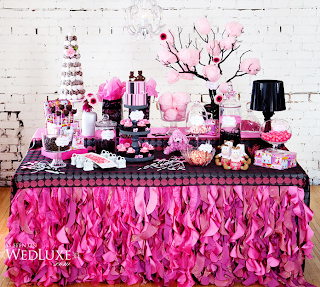 love sweet love ~ Imagine the look on a little one’s face as they see a sweet table styled just for them! 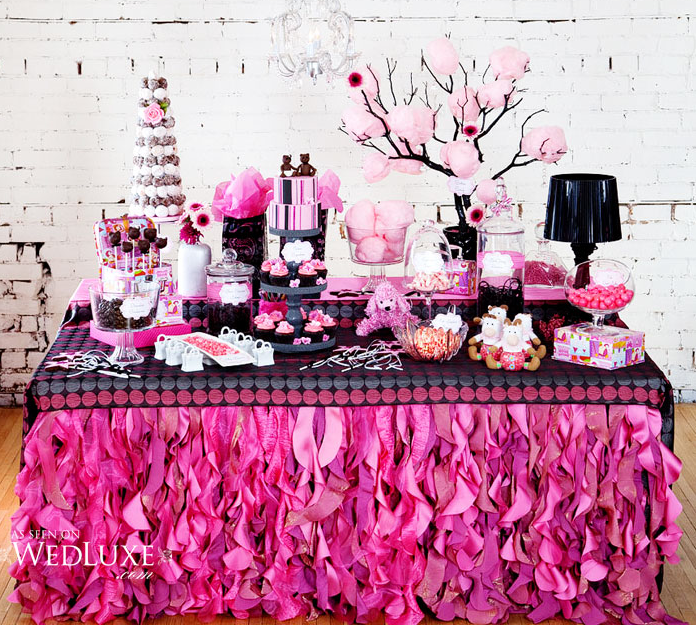 Aside from an extreme sugar high, little party-goer’s will surely remember this night forever. Table design, vessels and decor by Elizabeth Johnston of Eventdecorator.com. Vanilla bean cake pops transformed into bride and groom teddy bears complete with ears, tall tower filled with alternating rows of chocolate and sugar-glazed raspberry donuts, cookie wands decorated with edible fuchsia glitter, hydrangea flower cupcakes and two-tier cake with sugar bride and groom bears on top. 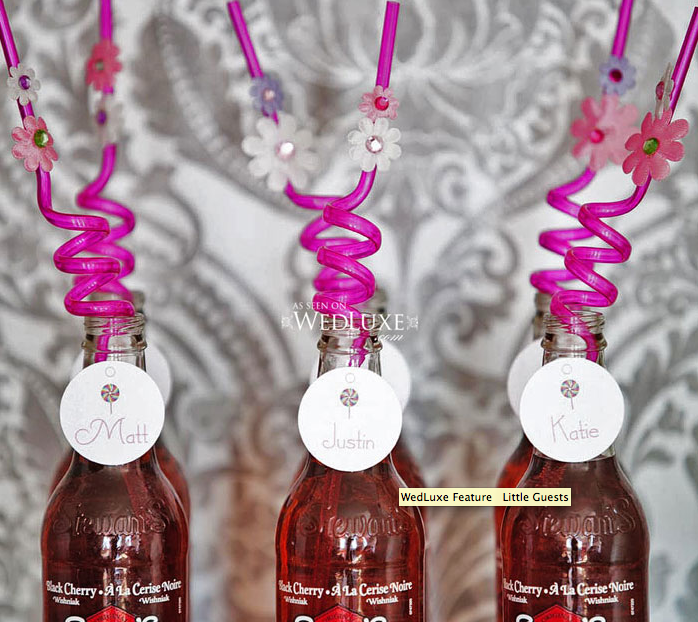 kiddie cocktails~Why not serve the little ones fizzy and fruity beverages in fun bottles complete with personalized straws.Name tags by Tina Caranci of So Pretty In Print. Last but not least, I adore the idea of having undecorated cookies (in the shape of teddy bears, in this case) ready to be decorated by wee hands! This will provide a yummy distractions while grown-ups enjoy the party! The soundtrack for your wedding is a big deal. It sets the mood (classical speaks to elegance and grace, while punk rock screams spunky and different), and can either make or break a party. Whether you’re hiring a six-piece string ensemble, a DJ, a rock band or are planning to load up an iPod with your fave MP3s, follow this handy checklist to make sure you have music in place for all the key moments. Choose up to four songs or arrangements for your processional to play up to 45 minutes: seating of the parents and grandparents, entrance of the wedding party, and for the brides or grooms monumental walk down the aisle. If you’re integrating ring warming, or unity candle lighting into your ceremony, you may want separate music to play during this silent moment. You’ve shared your first kiss as a married couple and turn to face the crowd. Your officiant announces you, and joyful, upbeat music commences for you to walk down the aisle. While you’re taking your family or couple photos, the rest of your guests are feeding their stomachs with passed hors d’oeuvres and partaking in your signature cocktail. This time traditionally lasts 45 minutes to an hour, so you’ll need to choose some tunes to get the party started, but not too crazy yet (after all, you two aren’t there, and the party doesn’t really get underway until you return and dinner’s finished). Your DJ or band will introduce you as you want to be known now that you’re married (if either or both of you have changed your names). Then they can introduce the rest of your wedding party. 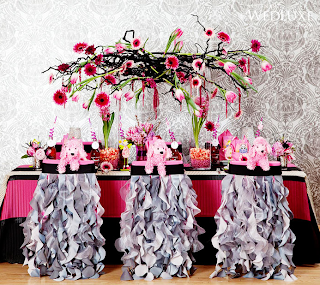 We like the idea of adding short bits of songs to surprise each person, like Fergie’s “Glamorous” for a diva maid of honor or the Pussycat Doll’s “When I grow up” for your flower girls. Your first dance as a married couple is likely one of the most fun songs to choose, as it says so much about you as a couple. It could be the song that you’ve identified as “our song” since the beginning of your relationship, your grandparent’s first dance song or something new you discover while you’re planning your wedding. There’s nothing wrong or right with this decision, but two things to think about: 1) It’s fun to have an original idea that not everyone else uses for their first dance song. 2) If you choose something at least slightly well known and not totally obscure, you can request it from bands and DJs for the rest of your lives on special occasions. If you are hosting your guests to dinner, come up with a genre that your band or DJ can select music from, like jazz or old-school country, that will play in the background while everyone dines, mingles and makes their toasts. Let them eat cake! 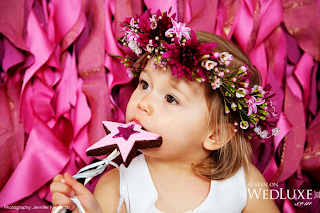 There’s a host of songs themed to sugar and sweets for your cake-cutting. We like “Sugar, sugar” by the Archies. Tossing the bouquet music. This time-honored tradition works when there’s an actual bouquet involved—or two. As of late, Beyoncé’s “All the single ladies” song and Cyndi Lauper’s “Girls just want to have fun” have been making the rounds at weddings across the country. If you’re having a dancing portion of the evening (and we highly recommend you don’t miss out on this delight), you’ll need to make two lists for your DJ or band: “must play” and “We will be so upset if you play this.” Make sure you include all your songs that you identify with as a couple, but also think about songs for your parents or grandparents to enjoy (think about surprising them with their first-dance songs from their weddings), music you can dance to with your friends and songs that everyone of all ages can get out on the dance floor and get down to. The last song that wraps up the evening. In a blink of an eye, all that planning you worked on for months has come to the send-off (if you haven’t left earlier), and it’s time to go out with a bang. Make sure it’s a good one!